Tom Felton, Draco Malfoy in the Harry Potter series, recently visited Orlando’s Universal Studios along with girlfriend Jade Gordon. 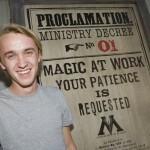 During their visit, Tom posed for a photograph beside a Ministry of Magic proclamation teasing construction of The Wizarding World of Harry Potter park. The Wizarding World of Harry Potter is currently being built at Universal’s Islands of Adventure park and will be open to the public in 2010. Emma Thompson, Professor Trelawney in the Harry Potter films, has squashed rumours that there was any bitterness in her decision to appear in a Nanny McPhee sequel instead of reprising her role in Harry Potter and the Deathly Hallows. The two films have a conflicting filming schedule, forcing Thompson to make the choice. “I wasn’t being rude at all. I was never going to be in the next ‘Harry Potter.’ I sort of put that to bed.” She has chosen to star in the sequel to “Nanny McPhee” as the title character instead. Dan Radcliffe has provided some commentary on two scenes in a new Harry Potter and the Half-Blood Prince preview piece by Entertainment Weekly. Emma Watson, the actress who plays Hermione Granger in the Harry Potter films, is intrigued by the Harry Potter and the Deathly Hallows split, according to a new interview with MTV. She’s yet to receive the script, and is unsure at what point the story will be split. Watson also commented on the feelings associated with her imminent departure from the franchise. Harry Potter and the Deathly Hallows: Part I will be released on 19 November 2010. Filming begins in February. From everyone here at Harry Potter Fan Zone, Happy New Year! From everyone here at Harry Potter Fan Zone, happy holidays! Hopefully you, unlike Ron Weasley, don’t receive another maroon sweater this holiday season. We hope you enjoy the rest, relaxation, and time with friends and family.